You guys bring happiness wherever you happen to be. It is always nice to hear a Tremeloes tune; it will change a bad mood with the very first note! Just wish y’all could come across the Atlantic to Alabama. Please tell my Tremeloe friend, Dave, “Hello” from Susan. I think it is wonderful that you are still involved, touring, and loving it! May you all be blessed in health, love, and happiness!!! Told a friend who lives now lives in Spain, that you are appearing in Shrewsbury a few days before she was due to visit. She told me if I could book tickets, she would change her flight. I have booked our tickets, and she has now changed her flight! We will be singing along to all you play. Looking forward to a super show. not, no problem just let me know and I’ll delete it. We wish you all the very best and really look forward to seeing you again soon. You are the best 60s group ever, we always have a good night when we come to see you all. We saw you last night at the Marlowe in Canterbury. What can I say, absolutely brilliant!You got everyone up and “bopping”, and when you sang Silence is Golden, bought a lump to my throat! Thank you for a fantastic night and keep doing what you’re doing!! We were slightly crazy fans in the 60’s and my friend Cheryl and I went to every gig close to Swansea that we could. We were avid members of the fan club and I still have lovely letters from Pam from all those decades ago. I am so looking forward to seeing you in Great Yarmouth at the beginning of July and will know every note of every song. So looking forward to the St Ives show July 6th. We saw you all in Bury St Edmunds (Apex) on 25th June. What an amazing show you gave us! It was so heartwarming to hear the songs from 60s and we all sang and bopped along with you. It was made especially memorable for me as you read out a letter that my husband had written to you about me meeting you briefly when I was 11 years old when I lived in Barking where you were also born. Thank you for that it was so kind of you and meant a lot to me. Really enjoyed your show at Stevenage last wednesday night (05 July).You guys obviously really enjoy doing it and that comes through clearly to the audience.Was only a small crowd at Stevenage last week but the people who were not there missed a truly brilliant show.Thanks Brian,Chip and Dave for a really enjoyable night.Look forward to seeing you again on the Gold tour later this year.All the best to you. 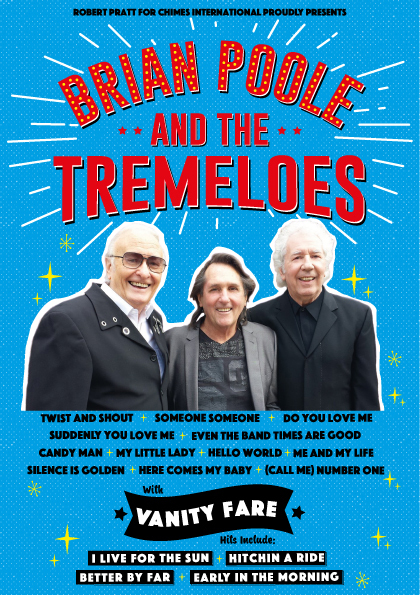 Brilliant show at The Apex, love all the Brian Poole and Tremeloes music, saw you again last night on The 60s tour at Ipswich,loved it Brilliant. Saw you in Leicester last night you were absolutely fabulous as were the rest of the 60’s Gold Crew. This Music will live on and on forever! How lucky was I to be a teenager during the 60’s Loe You All!!! Great concert in Cardiff last night. It was lovely meeting Brian, Dave & Mick afterwards and having a chat and some pictures. Looking forward to see you all again soon! Hi has any1 found out if dave chip n brian will b touring 2018 as would love 2 meet them again.